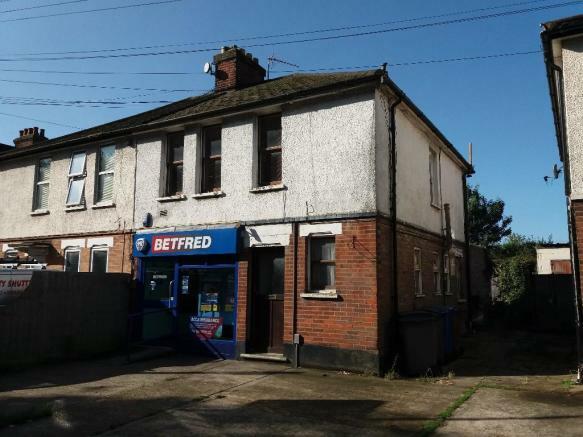 LOCATION: The property is situated in a prominent position on Nacton Road to the South East of Ipswich Town Centre, which is one of the main routes into the town. Other retailers represented in Nacton Road include Tesco, St Elizabeth Hospice, East of England Co-operative Funerals and chemists. forecourt. The property has a clear internal height of 2.4 metres and has previously been used as a betting shop. TERMS: The property is held on a 15 year Full Repairing and Insuring Lease expiring 27th February 2027 at an overall rental of £15,047 pax. The lease is subject to a further review with effect from 25th March 2021. Offers invited around £9,600 for the ground floor shop as the flat has been let separately. BUSINESS RATES: The property is currently assessed as Shop & Premises, Rateable Value £5,400. PLANNING: The property has permission within Class A2 Financial and Professional Services and is therefore suitable for Estate Agents, Employment Agencies, Banks and Building Societies. The property would also be suitable for Class A1 Retail Use. LEGAL COSTS: Each party is responsible for their own. Property reference 330NactonRoad. The information displayed about this property comprises a property advertisement. Rightmove.co.uk makes no warranty as to the accuracy or completeness of the advertisement or any linked or associated information, and Rightmove has no control over the content. This property advertisement does not constitute property particulars. The information is provided and maintained by Beane Wass & Box, Ipswich.